Yes, I’m a pusher. I’m that high-achieving dad that wants my child to excel. Which of course means that she needs to do things as early as possible. Talk, walk, play chess, read, ride a bike. I thought I had learned my lesson a couple of years ago. Daddy took Evie on a bike ride through our new neighborhood to a toddler park. On the way home, we went down a slight hill and I coasted down without using my hands. Evidently, Evie decided to try the same thing, as I soon hear the sound of a small bike crashing and turn around to see her and her bike sprawled on the ground. To make a long story short, my daughter ended up with her first ER visit and her first stitches. Lucky for her this happened before I started this blog or you would have seen the more gruesome pictures as well. 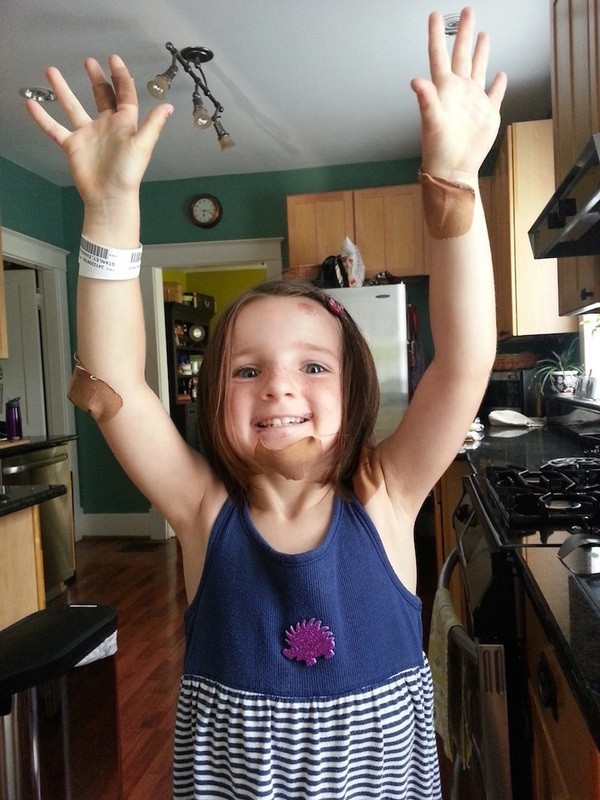 She obviously survived and enjoyed having tons of bandaids for a while, but her fear of bicycling started that day. Ever since then, bicycling is something that she only does when daddy gives her no choice. She’ll whine and complain until she gets on the bike, then have a good time until it is time to go down a hill. Her memory of that crash must still be strong, so she still is very cautious about going too fast down a hill. I’m okay with slow, and since I did learn something two years ago, I have not pushed her too hard, just occasionally reminding her that she can let up on the brakes. However, we did get her a bigger bike last summer at a garage sale. Last fall, I tried to get her to switch and it was a disaster. Tears, meltdown, the works. This spring I tried to get her to switch again. Same result. So I backed off. Every once and while I would remind her that if she was on her big bike, she could go faster and longer without getting tired, but that was all the pushing I did. Until tonight. Taking advantage of a daddy-daughter date night, I suggested (actually, I commanded) that we ride our bikes to Local Taco for dinner. The usual whining was followed by an incredibly pleasant ride and dinner with my beautiful daughter. It was a great night, and on the way back she asked if she could ride around our circle a few times. Delighted that she wanted to ride even more, I said yes. Then I casually mentioned that it might be a good time to try her bigger bike again. Incredibly, she agreed with me. She actually acted excited about the bigger bike, and when we got it out to the street, she quickly got on and proceeded to ride like she had been riding it forever! I would like to think I have learned my lesson permanently. But knowing me, I will probably continue to give her goals that are uncomfortably high. I can only hope to avoid the pain part. Now Evie, let us talk about that backflip on the trampoline you have been working on….